There have been many players who rose sharply and before the height of their powers could be reached they decided to leave the game for personal reasons. Leroy Muhammad was such a talent. Born Leroy Jackson, the St. Louis native was a young star in the 60s who later settled in New York after much success as a teenager. The year 1966 was magical for Muhammad. He won the St. Louis city championship four consecutive years from 1966-1969 and the Missouri State Championship three consecutive years from 1966-1968. Muhammad also tied for 1st place in the 1966 Eastern Open. He then won 1st junior in the 1966 U.S. Open with 8½-4½ beating future legend Walter Browne (New York) and Salvatore Matera (New York). Another scalp would become his most famous victory… a sensational win over the formidable Ed Formanek. Muhammad finished a sizzling attack and the invasion on the h-file proved to be deadly. Leroy Muhammad in 1978 after a brief comeback. No one seems to know the whereabouts of Muhammad, but Charles Covington has featured the Formanek game in his memoir and has provided the picture above. It is the only one of record. 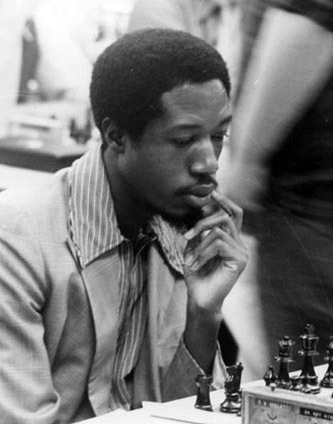 When speaking with Walter Harris, America's first Black National Master, he did not quite remember Muhammad, but certainly Muhammad was amongst the contemporaries (Frank Street and Kenneth Clayton) who were shattering the "color barrier" in chess. Update (8-2-2009): Leroy Muhammad lives in Gary, Indiana with his wife of more than 20 years, Aneesah. Together they have borne nine children and have six grandchildren. He operates a family business and is very active with the Muslim community there.